Technology has changed the possibilities within teaching and learning. Classes, which prior to the digital era were restricted to lectures, talks and physical objects, no longer have to be designed in that manner. Teachers and students now have a digital toolbox – ranging from engaging devices to teach the students to online courses and digital textbooks. Digital education is the term used to refer to all online educational practices. Projections show the e-learning market worldwide is forecast to surpass 243 billion U.S. dollars by 2022. In 2016, the self-paced e-learning product market amounted to 46.67 billion U.S. dollars and is projected to decreased to 33.5 billion U.S. dollars in 2021. A considerable share of faculty worldwide has shown willingness to support less traditional and digital education models. About 65 percent of faculty supports the use of open educational resources (OERs) in teaching, and 63 percent showed support for the competency-based education system. Students have also shown willingness to embrace digital learning technologies (DLT) and practices. About 92 percent of students worldwide are interested in personalized support and information on degree progress. They also showed interest in other academic performance analytics. Students are also interested on the use of different devices in the learning process. As of April 2015, about 56 percent of students worldwide wanted their instructors to enable them to use their laptop more in a learning context. Students already use this type of the device for school related activities. In the United States, about 56 percent of students stated using a laptop or desktop computer in the classroom on a weekly basis. 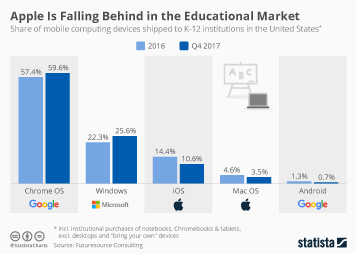 As of 2016, the most common digital learning materials used in weekly in PreK-12 classrooms in the United States were online educational videos, educational apps or software, as well as research websites. Students are turning to online courses as well. In 2015, 49 percent of students stated that they had taken an online course in the last 12 months. This share is slightly higher than 2013 and 2014 figures, when 46 percent and 47 percent of the students stated taking this type of course. Despite this growth, 73 percent of the students in the world are not aware of massive open online courses (MOOC). As of April 2015, the share of students that took a MOOC in the past year was still low – nine percent. From those global students who have interacted with MOOC and CBE, about 11 percent earned a competency-based badge, and about 19 percent said they would use competency-based digital badge on their resume. Topic: Higher education graduation in the U.S.
More interesting topics from the industry "Education & Science"